There were a number of bronze sculptures of children and his was the first we found. 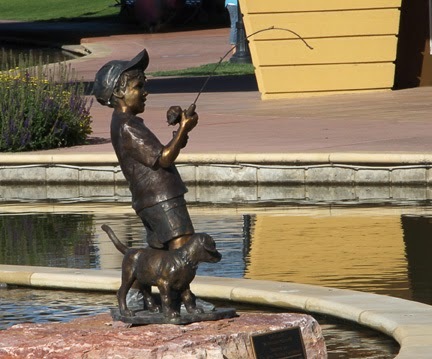 The little fisherman was placed on an island in the middle of the river and appeared to be having a great time. My cousin reports that they continue to add to the Riverwalk as they are able to get more funding, some of which comes from lottery revenue. So keep buying those tickets! How nice to know that everybody does indeed 'win' with those lottery tickets!